The sound took over, then the smells, then the cold, then the smoke. (But not so many) looting. Hometown markets, stores, shops. One day away from perfection. It seemed so close. On fire, storefronts smashed, pilfered, gashed. Noticing not to notice, keeping the peace, nurturing the dream. But not today, no one came but me. White boy in Harlem. With a hundred years of matted gum, multicolored gray. Surround hapless white boy. Why was I here? Did I not hear? Bags of who-knows-what, while buildings burned, while Harlem burned. And the message got twisted in Harlem as people torched their own town. Hallelujahs to its holy flock and prayed for a more civil right. The night settled in, looting subsided, buildings collapsed in smoldering ruin. Newly aquired TVs broadcast death of a leader, a man of will, a man of faith. To not let others know our fear, our shame, our wistful hope. 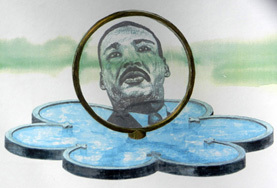 You can see the above illustration of the King Monument in our MLK Memorial section, which describes my 1999 entry for an international competition for the design of the Martin Luther King Jr. Memorial. Read more about this experience on the Schomburg Collection page.